The following lighthouses are somewhat accessible to the public and provide nearby parking, except for the New Point Comfort, which is accessible only by boat. Many tourists plan their vacations around lighthouse visits and enjoy learning the history associated with these magnificent towers. The Old Cape Henry Lighthouse, built in 1792, is the oldest lighthouse on the Chesapeake Bay and the third oldest still standing in the United States. The unpainted sandstone tower stands 90 feet tall and was reinforced with a brick lining. It serves as the official symbol for the City of Virginia Beach and is located on the grounds of Fort Story, a U.S. Army base. In 1791, Alexander Hamilton contracted with John McComb Jr., its designer and mason. Once the lighthouse was completed, George Washington checked the list of applicants for keeper of the lighthouse. The first keeper was Laban Goffigan of Norfolk, who lit the fish oil burning lamps to make the Chesapeake Bay safe for sea travelers. During the Civil War, Confederate troops purposely damaged the light to make navigation of the Chesapeake Bay dangerous for Union troops invading the area. In 1870, large cracks appeared on six sides of the octagonal tower, and it was considered unsafe. Today, it still stands and is maintained by the Association for the Preservation of Virginia Antiquities. It is open year 'round except in December, when it is decorated like a giant Christmas tree by the U.S. Army. 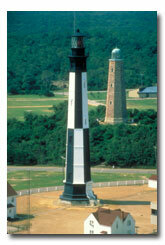 The new Cape Henry Lighthouse was built to replace the old one in 1881. It sits only 357 feet away from the original and is the tallest cast iron lighthouse in the United States. The 164-foot octagonal tower has been operated by the U.S. Coast Guard since 1939. During the early part of World War II, the top was used as a battery commander's station for Battery Walke, which contained two 16-inch howitzers. Although it is not open to the public, it can be seen from the original lighthouse. 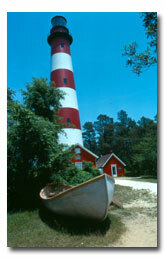 The Assateague Lighthouse is located on Assateague Island at the Chincoteague National Wildlife Refuge. It was first built in 1833 and rebuilt in 1866. The tower stands 145 feet tall and continues to warn ships of treacherous shoals that lie off the barrier islands. It is operated and maintained by the U.S. Coast Guard and only open for inside tours a couple of times a year, but visitors can see the exterior year around from the refuge. The "Legacy of the Lighthouse" tours are presented throughout the summer, which is considered "a must for lighthouse lovers." Located at Fort Monroe in Hampton, the Old Point Comfort Lighthouse, it is operated and maintained by the U.S. Coast Guard and not open to the public, yet it can be viewed from the street. The keeper lives in an adjoining house owned and maintained by the Army since 1973. Overlooking the entrance of Hampton Roads and commissioned by Thomas Jefferson, it is the second oldest on the Bay, built in 1802. It stands 54 feet tall and is an octagonal sandstone structure. During the War of 1812, it was used as a watch tower. During the Civil War, it was riddled with bullets by naval guns. The New Point Comfort Lighthouse was commissioned in 1804 by Thomas Jefferson. It stands 63 feet tall and is an octagonal sandstone structure. During the Civil War, Confederate soldiers disabled its light to make it dangerous for Union troops to navigate the Bay. 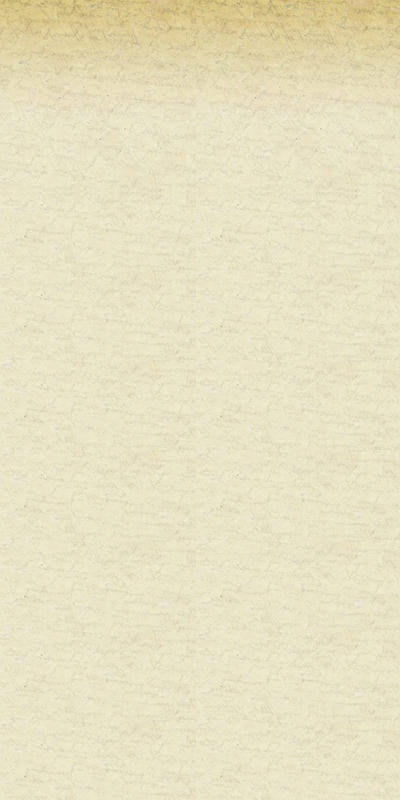 After the war, it was fixed. In 1919, it was partially automated, putting its keeper out of a job and house. New Point Comfort Island was acquired by the Nature Conservancy in 1979, which turned it over to Mathews County as a natural area in 1982. Today, the lighthouse is not officially open to the public, and access by boat is not restricted. Most visitors prefer to look at it from the observation deck at the preserve.